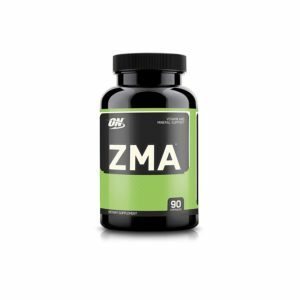 ZMA Supplement – Why you need it! Protein supplements and creatine are two valuable supplements for everyone who train hard. Furthermore, most people even use a PWO every now and then, for that extra degree of madness during a training round. We also certainly take some multivitamins, (when we don’t forget to.) Add some amino acids and we have everything on the list. Here we have the basis of what many athletes use as a supplement to their usual diet. Let’ have a look what ZMA Supplement is? But, is that all? Are there any other supplements that we can benefit from, as we miss in all advertising about protein and caffeine? “ZMA”, hardly anything you need. Or do you? Of all the “other” dietary supplements, ZMA has to be the most frequently used. As you know the abbreviation is of zinc and magnesium. Often, the supplement also contains a dose of vitamin B6, as this facilitates the absorption of zinc and magnesium in the body. Zinc is used by the body in a multitude of processes. It also plays a central role in metabolism and in the body’s hormone production. According to research, zinc and testosterone seem to have a correlation. High levels of zinc in the body seem to mean the same for testosterone. And if you like muscle growth – you like testosterone. Zinc thus helps to maintain a good testosterone level in the body, but it does not contribute to a new testosterone synthesis. Zinc is found mainly in eggs and milk, but also in oysters. Unfortunately, zinc is a very volatile substance which is difficult for the body to absorb food. Lack of substance can lead to most problems including depression, learning disabilities, eczema and digestive problems. Some research has also shown that zinc inhibits the body’s inflammatory processes and the oxidative stress on the cells. This may be the promotion of the immune system and possibly help reduce the number of infections. Of all the substances of the body, zinc is the one we lose the most of during exercise, especially through heavy sweating. Magnesium is a mineral and like its good friend zinc, it is common in a range of body metabolic processes. For everyone who trains hard, it may be particularly important to know that magnesium plays a major role in protein synthesis. Lack of substance can lead to depression, migraine or in severe cases, contributing to diabetes. Magnesium is found in most foods but occurs most frequently in dairy products and nuts. The absorption of magnesium is inhibited by alcohol intake, high protein, and carbohydrate intake. This could explain why magnesium deficiency is so common among those who exercise often. Of course, I’m referring to protein intake, how much beer and wine people pour themselves are highly individual. Most people who think about using ZMA, or already use it, do it mostly because it is said to improve sleep quality. Better sleep leads to more efficient recovery and thus more optimal muscle growth. Magnesium together with zinc, is likely to have a reducing effect on the amount of cortisol in the body. This could be a contributing factor to the fact that many people experience a better night’s sleep when using ZMA, you could read more about ZMA and other supplements at testosteron tilskudd. Magnesium is also an important part of the body’s general metabolism and for maintaining good flexurality. It is always difficult to come up with a general advice about dietary supplements, as intake may be needed for some, but totally unnecessary to others. However, when it comes to zinc and magnesium, there seems to be support for most of us taking advantage of this supplement. As mentioned above, the absorption of the two substances is sensitive, while sweating a lot causes us to lose especially zinc. Zinc deficiency is also common among athletes who exercise hard, why this dietary supplement would be very useful for all who exercise. Especially if we keep in mind the benefits that zinc brings with regard to recovery and muscle growth. My advice to you is therefore – try ZMA Supplement! It is likely that your muscles will thank you for it!